Crystal Sound Mastering is a purpose built complex based in Yorkshire, Leeds; we offer an Industry standard CD mastering service to all the local musicians, songwriters, bands and DJs requiring a place to have their material mastered in a professional manner. Crystal Sound CD Mastering offers all industry standard mastering equipment available for use by serious people wanting to turn out top quality audio productions. We also do re-mastering of old audio master tapes or demo cd's that you may have had recorded elsewhere, we also offer a in house post production service for any recordings you may have made at home studio on your computer. At Crystal Sound CD Mastering we can turn your demo into a polished commercial industry standard CD master, which we believe could make the difference between you selling your music online or securing the right kind of record deal for you or your band. As a cost saving measure, most burners that come with home computers are not capable of burning discs that meet the requirements of CD replicators. They're designed for home use only, not professional audio. To CD replicators, mastering means creating the glass master disc that is used to make stampers (which are then used to press the CDs). Almost every CD plant prefers to make its own glass masters, for quality control reasons. 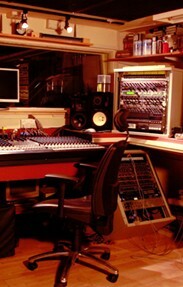 The glass master should be a perfect copy of the CDR Master disc produced by the music mastering facility. This is the final creative step in the mastering process for producing your CD master. One hallmark of pro mixes is that they sound great in mono. This is important for songs that will be played on FM radio. Remember the mastering engineer has fresh, experienced ears. By the time the mixes are done, everyone involved is fried. It's tough to keep a true perspective after you've heard a mix 50 times or more. A new outlook, a new set of listening skills - attuned to the complete presentation rather than the detail of the mixes - can make a huge difference. A mastering engineer must be fluent in both the artistic and technical areas of music - making. Good communications skills are so critical, since a lot of terms are used to describe sound. For example: "It needs to sound big, resonant, fat, warm, taut, sweet, present, smooth and have a live feel. It needs air, sparkle, depth, brilliance, impact, punch, focus, clarity and definition." CD Mastering enables your recording to faithfully reproduce your vision, making it the most musical and commercially competitive it can be, and bridging the technological gap between the artists’s recording equipment and the listener's stereo system. Mastering can make a huge difference in the competitiveness and musical value of your product - and it is also the greatest bargain in the entire workflow of making a CD. Please remember that CD mastering will really give you or your band a great advantage when it is being listened to by; promoters, music publishers, club agents, managers, production companies, record companies and tour managers. Vinyl Records , Cassette Tapes and Video Transfers. We also transfer 45s, LPs, 78s vinyl records to CD and any old cassette tapes to CD and video from various camcorder formats such as mini DV Hi 8, VHS, and VHSC can also be transferred to DVD at Crystal sound mastering.